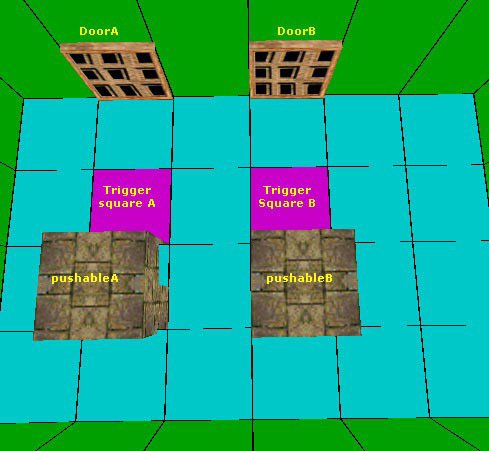 First, we will make the OCB settings for the two doors and two pushable objects and then we'll add the triggers. DoorA opens when PushableA is positioned on Trigger sqare A. If you push it on the Trigger square B, nothing will happen. DoorB opens when PushableB is positioned on Trigger square B. If you push it on the Trigger square A, nothing will happen. PushableB = Press the button 2 and write 2 in the timer field. Select Pushable A and set a Heavyswitch trigger on Trigger square A. (Yes, you apply a Heavyswitch trigger for the pushable). Before closing the trigger box, make number 1 pushed (black). All others must be off (gray). Select Door A and set a normal trigger on the same square (Trigger square A). Select Pushable B and set a Heavyswitch trigger on Trigger square B. Before closing the trigger box, make number 2 pushed. All others must be off. Select Door B and set a normal trigger on the same square. Pushable C = press the 3 button and write 3 in the Timer field. Set a Heavyswitch for Pushable C and press the 3 button in the trigger box. All others must be off. Then set a normal trigger for Door C on the same square. ... and so on with the 4th and 5th pushable objects and doors.